It has been another successful and very busy year for the charity. Financially we continue to raise large amounts of money and improve the profile of KatCanDo. Our charity is not only known locally but is spreading over a wider area of SE Surrey and NW Hampshire. Our fundraising efforts -17 events in total - during the year from April 2017- March 2018 have consisted of stalls at the Surrey Heath Show including car park" attendants", Hartley Wintney Fete and Frimley Green Carnival; the Shalford Walk; Farnham Bike Ride; Collection Days at Bagshot Waitrose and Longacres Garden Centre; a Fashion Show; litter picking at Frimley Lodge Live; the Proms Extravaganza; a Bridge Drive with afternoon tea;2 Quiz Nights; an Indian Meal at the Mogul; Sale of Xmas cards and recipe books; and the revenue from the 100 Club. Other income has come from bequests in memory of family and friends known to KatCanDo members; donations from SC Johnson; Recycle4charity collecting old mobile phones and ink jets - £437 over a few years; a percentage of the takings of the Brightlight amateur dramatic group - over £3000 in the past 4years - and people who wanted to make a donation to a local worthy charity knowing that the money would be spent for the benefit of cancer sufferers in the local community.  Barclay’s Bank provide £ for £ matching scheme for a nominated event of the year.  SC Johnson with their “Giving back to the community” scheme and 20 year club. The outcome from all this hard work – enjoyment – and support is that we have raised a total of £28,000 for the financial year. This has enabled KatCanDo to donate money towards equipment and items to assist and contribute to the well being, health and treatment of cancer patients in our area. We have improved our relationships with new contacts both at Frimley Park Hospital, Basingstoke Hospital and The Royal Surrey, Guildford. We are constantly promoting the Charity through local media - newspapers articles when we present cheques for requested equipment - and a presentation at Farnborough Rotary Club. The charity has had invites to official openings of the refurbishment of the Paediatric Ward at Frimley Park Hospital and the refurbishment of areas at Christopher's Hospital Shooting Star Chase, Guildford. We still have an ongoing request for televisions for two Oncology cubicles on the Paediatric ward at Frimley Park Hospital. We will guarantee to fulfil our obligations/promises to this organisation. As we start a new financial year new requests are coming in from both the Royal Surrey Hospital and Basingstoke Hospital which we hope we can commit to or raise funds towards. Our list of "Friends of KatCanDo" is ever increasing, who not only enjoy receiving news of future events, but we also have "friends" who are willing to become more involved with the charity by helping out at events and providing us with the most delicious cakes for our stalls. 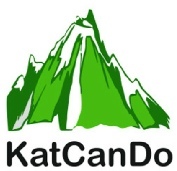 'Cash for Gold' situated in Farnborough and Camberley have named KatCanDo as their charity of the year. Thus in conclusion, thanks go out to all the Trustees, Committee Members, family, friends and supporters who continue to support the charity to achieve its aims in making a difference to the lives of cancer patients. Our commitment is a willingness to give our time and energy to something we believe in - Kate's Legacy.